North Carolina Lt. Governor and candidate for governor, Walter Dalton. North Carolina Lt. Governor and candidate for governor, Walter Dalton, is coming to CPCC’s Central Campus for a town hall meeting on Tuesday, August 14. The meeting will be held in Tate Hall, beginning at 1 p.m. Students, faculty and staff are invited to attend. Lt. Governor Dalton will take questions from those in attendance. This entry was posted in Campus, Central Campus, Events and tagged Central Campus, Taylor Hall, town hall, Walter Dalton by Adam Brooks. Bookmark the permalink. N.C. Lt. 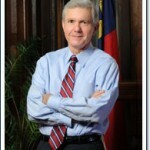 Governor and candidate for governor Walter Dalton will host a town hall meeting Tuesday, August 14 at Central Campus. Students, faculty and staff are invited to attend the event at 1 p.m., in Tate Hall. Lt. Gov. Dalton will offer his ideas on education and creating jobs and will take questions from the audience.